The OMNI Econo Hitch is the newest addition to our product line. The 2" receiver on this hitch is a universally accepted method for trailer transport and many other trailer hitch items. The OMNI Econo Hitch has a 3" x 3" x 3/8" H.R. angle Main Draw Bar with a reinforced square tube trailer receiver welded to it. There is also 2-1" holes to mount additional trailer balls, clevises, hooks, etc. The vertical member is a 2 1/2" x 2 1/2" x 3/16 square tube. We don't skimp on the material or labor quality to produce a hitch for $100. We just use a simpler design to reduce the cost. A MIG welder is used to tie it all together into an extremely solid platform. To top it all off there is a Premium Gloss Black color enamel paint applied. 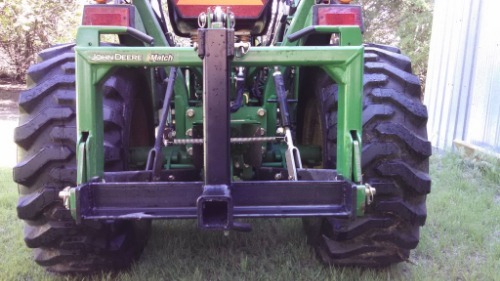 This hitch is built to JD Imatch specifications. It will fit most standardized Quick Hitches as well. Width between lower link pins is 26" and the distance between top link and lower link pins is 15"